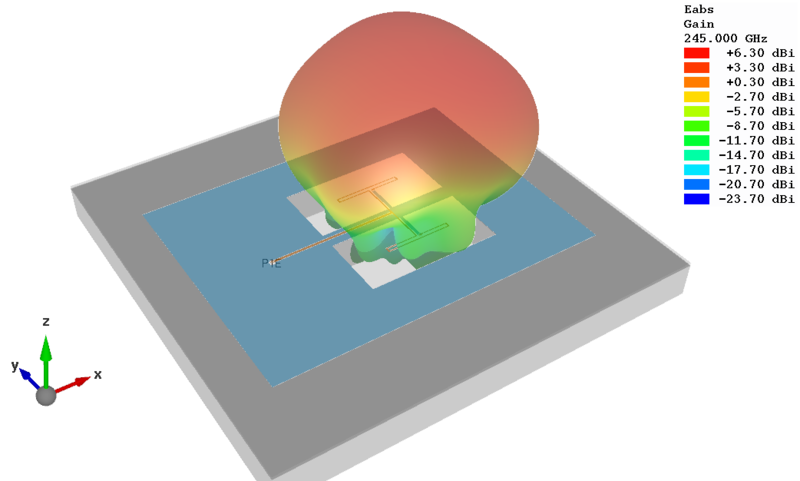 This application note describes on-chip antenna modelling with Empire 3D EM. The antenna design in this appnote is based on: K. Schmalz, W. Ruoyu, J. Borngräber, W. Debski, W. Winkler , and C.Meliani, “245 GHz SiGe transmitter with integrated antenna and external PLL,” in IEEE IMS, 2013, pp. 1–3. Drawings with antenna dimensions can also be found here on pages 80-82. First, an empty simulation model was created using the Empire template for IHP SG13S/SG13G2 technology with substrate thickness set to 200µm. 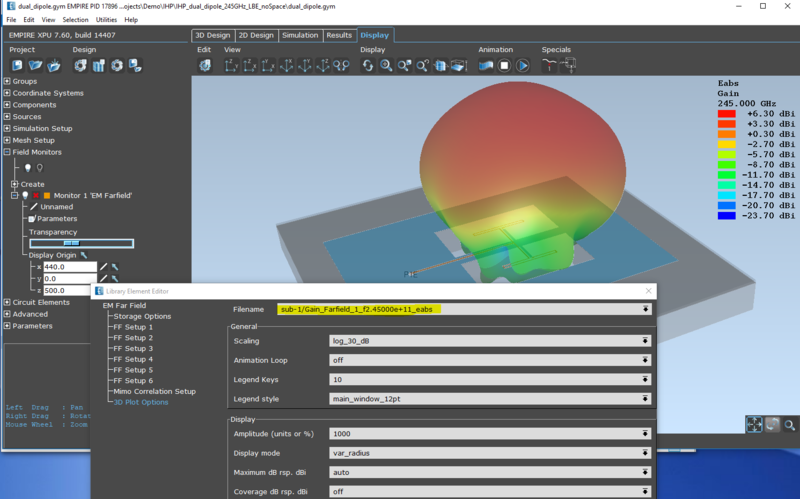 This template creates an empty model with all metal, via and dielectric materials already predefined, with the correct position and height and material properties. For the antenna, geometries were then drawn in the Empire 2D editor, based on dimensions given in the paper. The size of Metal1 ground plane and some feed line dimensions are not specified there, so these dimensions are an educated guess. For the antenna feed, a perpendicular port from TopMetal2 to Metal1 was created. The structure type was changed to “antenna”. To ensure good absorbtion at the boundaries at any angle, boundary conditions were changed from absorbing sheet (= template default for structures with little radiation) to perfectly matched layer (PML) with 6 sheets and automatic distance from the drawn structure. 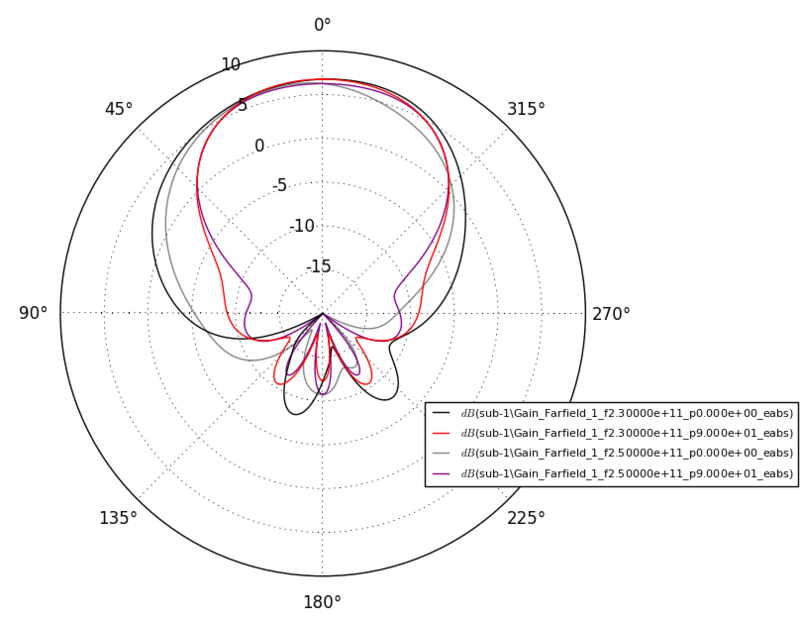 Only at the bottom of the model, an electric boundary was used to represent the “module ground plane” described in the paper. For good accuracy, medium mesh settings were used with 15 cells/wavelength and a minimum of 5 cells for the conductor width. This results in a total of 1.8M mesh cells net (2.5M cells including PML6 boundaries), with minimum cell size of 0.4µm in vertical direction. 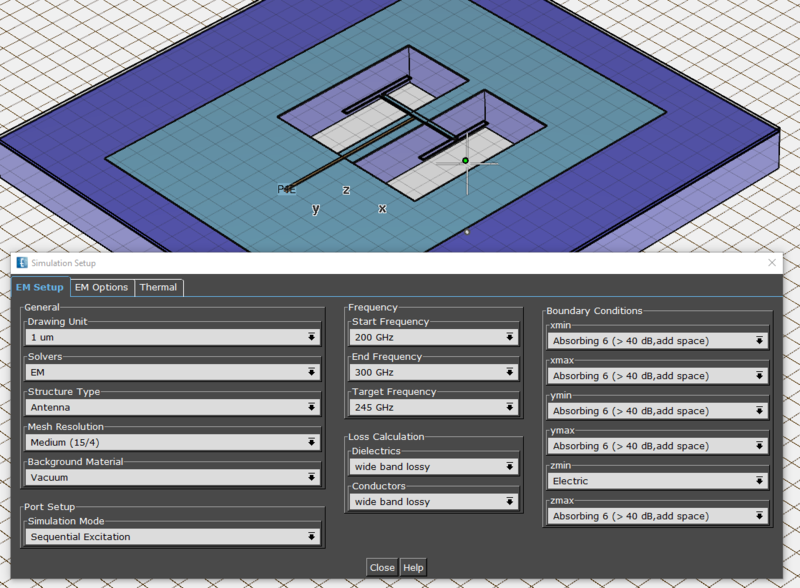 For antenna parameter calculation, a Field Monitor of type EM Far Field: Boundary was created. This samples the field at the outer boundary of the model. Therein, FF Setup 1 to 4 were enabled: far field for fixed phi=0°, phi=90°, both angles sweept for 3D pattern display, and finally the gain at theta=0, phi=0 for antenna gain plot over frequency. For all these parameters, normalization was changed from “directivity” to “gain”. 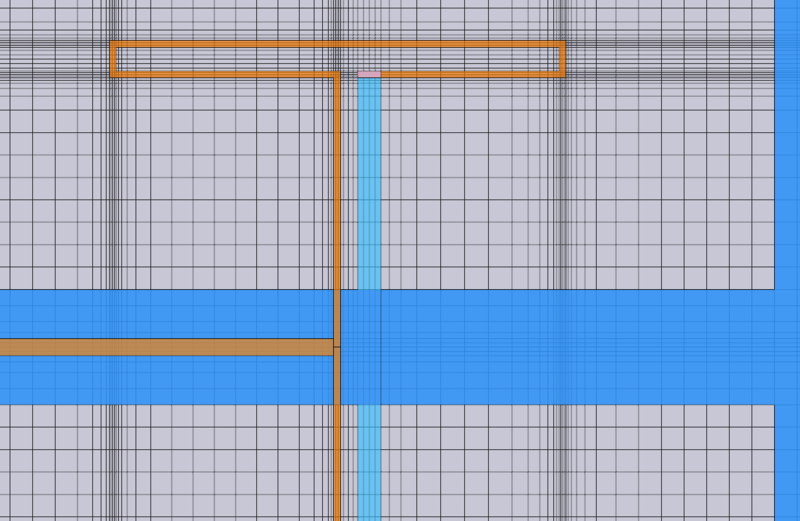 In the 3D editor, the orientation of selected far field cuts is shown when the field monitor is enabled. 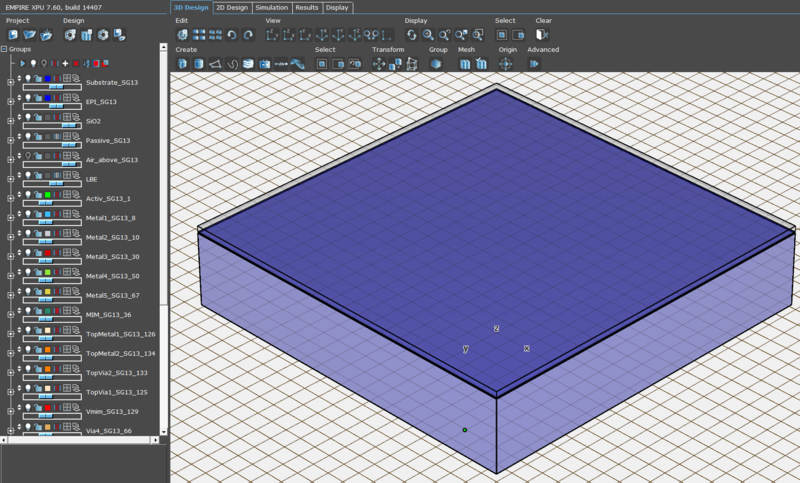 Model size is 1.8M mesh cells for geometries, or 2.5M mesh cells total including the PML6 boundaries. Simulation time on a Core i9-7940X desktop computer is 2min : 20sec for the full frequency range 200 – 300 GHz. 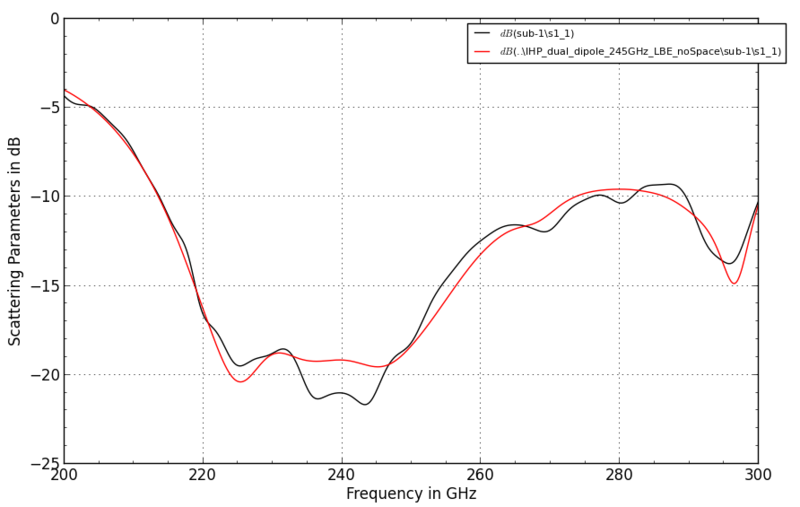 In the plot below, the black curve shows the input matching from 200-300 GHz. The ripple is a true physical effect, caused by internal reflections in the silicon substrate, and depends on the substrate size. It is seen here because the absorbing side boundaries are placed at 1/4 wavelength distance from the substrate, and don’t attenuate the substrate resonance. If we place the absorbing side boundaries directly at the substrate, that ripple disappears, as shown by the red curve. If we are interested in the actual ripple for a given chip size, the substrate size needs to be modelled accordingly. 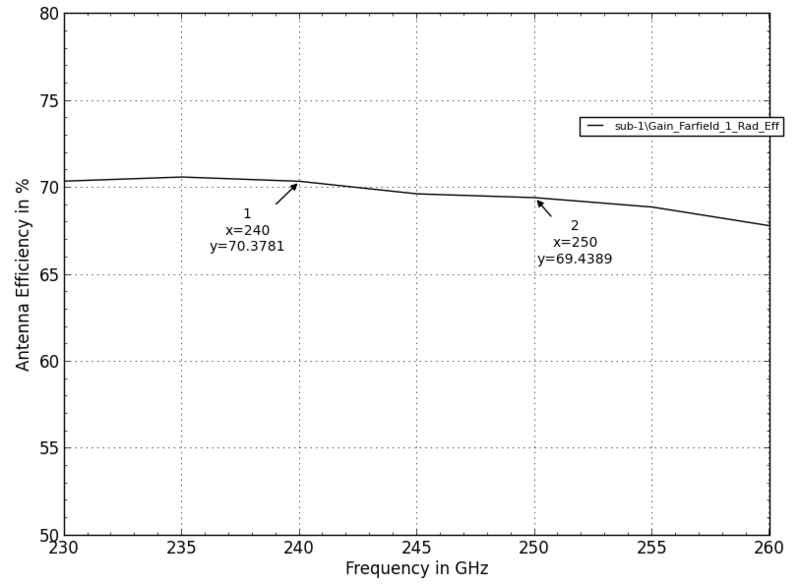 The antenna gain (abs) for phi=0° and phi=90° is shown in the plot below for 230 GHz and 250 GHz. This agrees well with the 7dB gain mentioned in the reference. For each far field calculation, the antenna efficiency is calculated from the total radiated power and the input power into the antenna. This is available in results window as “nu(f) Antenna Efficiency”). 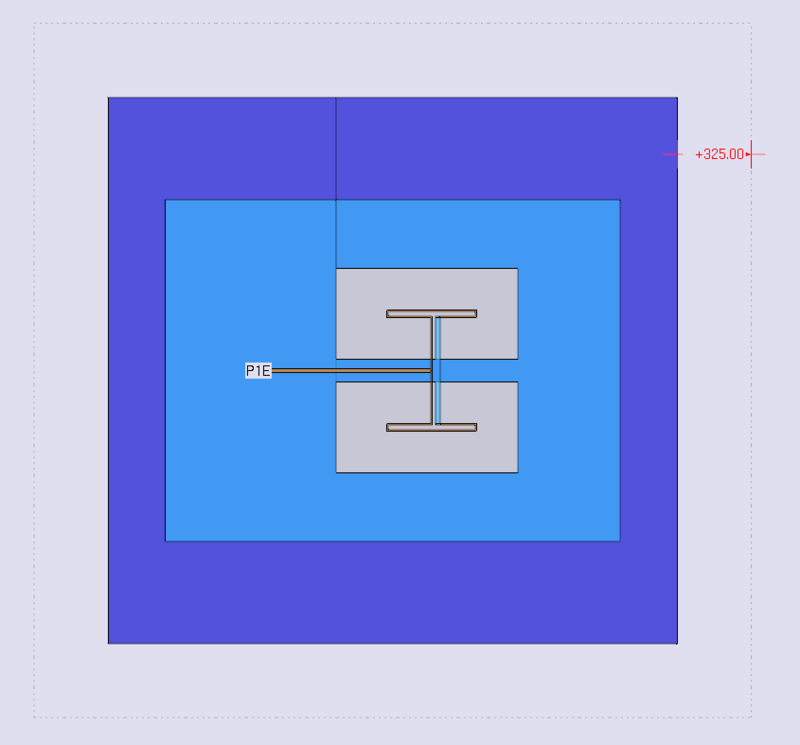 This ends our application note on simulation of an RFIC on-chip antenna in IHP SG13S/SG13G2 technology. For more information on the SG13S template for Empire XPU, have a look here. For more information on Empire XPU meshing for RFIC simulations, have a look here.